Shatter the myths and lies about PMS and start believing the truth that comes with knowing how the body actually works. For three weeks out of every month, a woman is energetic, upbeat and even-tempered. Then something happens! Within seconds, she can move from being calm into depression or out to the edges of hostile anger. She can crave junk food, feel lethargic and not about to focus her concentration on even the simplest task. For millions of women, these symptoms subside just as menstruation begins. A great deal has been learned in recent years about PMS and doctors can recommend an array of traditional and complementary remedies to help reduce symptoms. 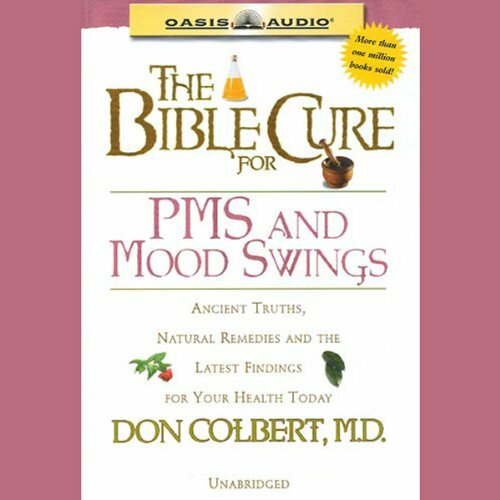 Dr. Colbert's extensive training in alternative therapies makes this audibook extremely helpful for women who suffer with PMS. Listen to all of our Bible Cure titles. It puts a biblical twist on the scientific reasons for PMS and premenopause. It explains why diet is so crucial to avoid PMS. How different foods effect your different hormones and how hormones can get out of whack by being deficient in something. It reinforces and explains WHY you want to eat healthy instead of just telling you to eat healthy. It encourages you to "Eat closer to the Garden of Eden".